This past October we were blessed by working with our dear friend Steve Hyde in Cambodia. So much happened that I will be posting on Cambodia a number of times over the next few weeks. On this post I wanted to share with you a post that Steve wrote that describes clearly the spiritual battle that we are in. I have often stated that abortion is primarily a spiritual issue not a political issue. Steves blog entry on November four will clearly support my position. Over the last year we have been teaching and counseling people on the sanctity of human life. In Cambodia, which is well-known for its “Killing Fields”, the value of human life is seldom promoted. Satan has had a strangle hold of death on this country for multiple millennia. John 10:10 tells us of Satan’s plans saying, “The thief comes only to steal and kill and destroy”. Satan is all about death and destruction. Cambodia has been his playground for thousands of years. The “Killing Fields” which were perpetrated by the Khmer Rouge (Maoists) and resulted in the deathof nearly 40% of the population was not the first, nor is it the latest genocide in Cambodia. Today, NGO’s, UN agencies, foreign governments, pharmaceutical companies, and “health services” are aborting up to 80,000 Cambodian babies per year. People’s consciences have become immune to the horrors of death. Recently I met a lady who previously performed hundreds of abortions. Knowing this woman’s occupation I became curious because she does not have a medical background. She was a spirit medium and fortune-teller. A few years ago she became a Christian. During a time of prayer she felt convicted to confess her past sins to God to seek his forgiveness. She began to pray. She confessed anger, bitterness, and hatred toward others, along with other petty sins. Then she confessed her role in abortion and snuffing out the lives of so many vulnerable and innocent unborn babies. Immediately she collapsed. He body violently shook and she did not regain consciousness for some time. Clearly some spiritual activity was going on. Upon receiving forgiveness from Jesus Christ, she has become a transformed woman. My wife asked her how a spirit medium performs abortions. She described the procedures: A woman would come to her and tell her she wanted an abortion. So, she would ask basic questions of the lady like her age, name and other details. She would then tell her to come back at a later date. Often, if the baby was too small (less than two months) she would tell the lady to come back when they were “more pregnant”. She said that abortions were performed even into the 8th month of pregnancy. Being a spirit medium, she would only perform an abortion when she received guidance and instruction from demons. That is why she would tell the women to come back at a later time when she called them. So, she would ask the demon spirit which was inside her to give her instructions. Often in a trance, the demon spirit would tell her different instructions for each woman. Sometime it required pressing on the stomach in a certain place. Other times it involved inserting a stick with poisonous vines into the uterus to kill the fetus. All of the procedures were done only with her bare hands and no instruments at all. The demon spirit would tell her exactly how to perform each abortion so the procedure would be successful. Over the years she performed hundreds of abortions. This was shocking news to me. I knew of so many other kinds of abortion procedures and poisons used in abortions, but when I heard of these “demon abortions” I knew that the demons are using abortion as the modern “human sacrifice”. Demons demand blood and they demand death to keep their power over people. Ritual human sacrifice would be banned and is illegal in nearly every country of the world, so demons are using abortion to satisfy their desire for blood and death. Thinking that I stumbled on something new I began to research and discovered “demon abortions” are not new at all. 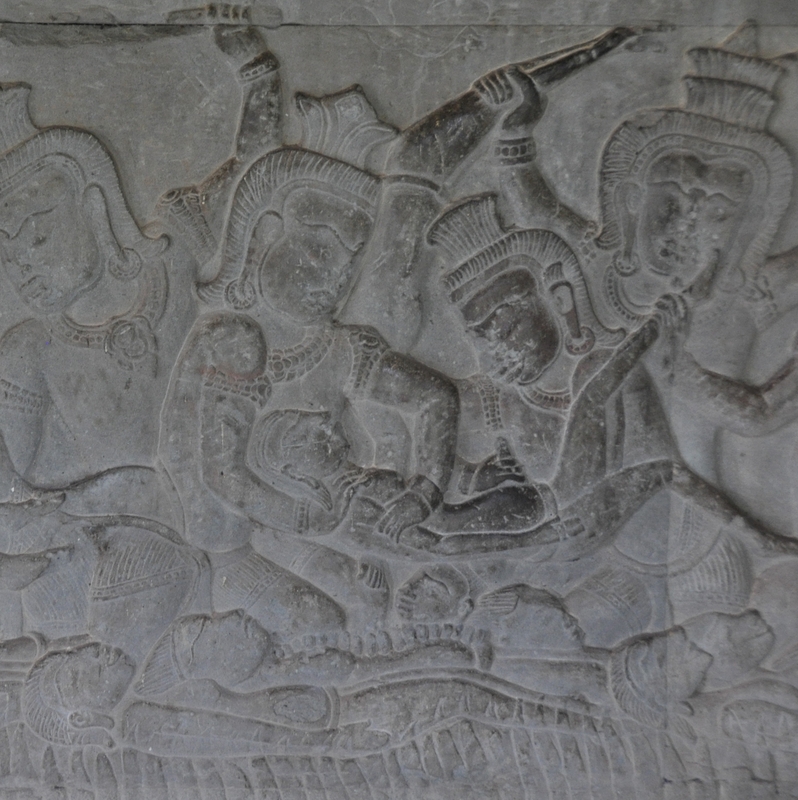 In the bas-relief carvings which are intricately carved into the walls of Angkor Wat here in Cambodia there is a depiction of what scholars say are demons performing an abortion on an unwilling woman. These images were carved as a permanent reminder of demonic desire for human sacrifice nearly a thousand years ago. You can see the depiction of several demons (identified by their headdresses) holding a woman as one presses a pedestal into her pregnant stomach to induce an abortion. Jesus wants to see Cambodia value life and for each person in Cambodia to have an abundant life. Not just in Cambodia, but around the whole world. Picture from: Potts, M. et al. “Thousand-year-old depictions of massage abortion,” Journal of Family Planning and Reproductive Health Care, volume 33, page 234 (2007)”. I encourage each of you who read this entry to follow Steves blog . You can find his site connected to this site.